Can Surface Pro 4 of Microsoft Put New MacBook of Apple on Defense? With the expected launch of Surface Pro 4 in near future to host the Windows 10, the new flagship operating system of Microsoft, is Microsoft planning to compete new MacBook of Apple? While there is a fair comparison of the Surface Pro 2 to the iPad of Apple, but still good comparison can be there between Surface Pro and new MacBook. Some may not agree, but when some of the hardware specs are compared, Surface Pro 3 appears to be closer to the MacBook. Though the specs of Surface Pro 4 are not disclosed, officially, but even specs of Surface Pro 3 are comparable to the MacBook, keeping aside Surface Pro 4 which is expected to have better hardware. As displayed in a table, the hardware specs tells a story to support the logic that Surface Pro 4 can pose a serious challenge to the New MacBook. MacBook is heavier in weight with 2.03 pounds while the Surface Pro 3 is lighter with 1.76 pounds. With RAM of 8GB and Storage of 256GB being equal in both the devices, yet MacBook has an edge on with Display of 12” but resolution of 2301×1440 while the Surface Pro 3 has Display of 12” and resolution of 2160×1440 – screen resolution of the MacBook is better. 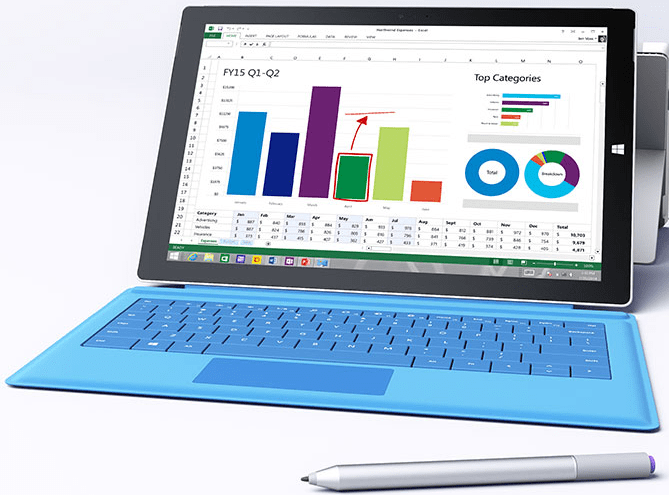 With the increase in revenue, resulting in sale of Surface Pro 3 to 24%, i.e. $1.1 billion, during the last quarter, the situation is presenting a worrisome picture for the Apple as the Microsoft may present a better Surface Pro 4 with better specs to compete the MacBook. This is the scenario in which gurus are predicting the Apple to be at defensive from distance with a glooming, worrisome and serious state of affairs for the Apple. Let’s see how the Apple comes forward with a solution to face the challenge.